Game description: A collection of demos from the Official PlayStation Magazine. 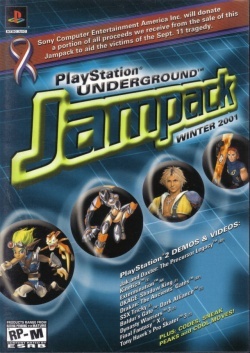 The disc contains demos of Baldur's Gate: Dark Alliance, Drakan: The Ancients' Gates, Extermination, Final Fantasy X, Kinetica, SSX Tricky, videos of Dynasty Warriors 3, Jak and Daxter: The Precursor Legacy, Okage: Shadow King, Tony Hawk's Pro Skater 3 as well as Behind-the-Scenes movies on Jak and Daxter: The Precursors Legacy and Extermination. This page was last edited on 20 December 2016, at 15:53.